To Quincy, Ceara is a charming and quite likely deranged spinner of dreams who can’t prove she’s telling the truth. But how can he pass up any attempt to restore Loni to health? Against all better judgment, he decides to marry Ceara. Maybe he’s making the worst mistake of his life. Or maybe he’s opening himself up to possibilities that defy explanation...and will send him on a miraculous journey toward enough love to last forever. Perfect Timing is the perfect read for hopeless romantics. Catherine Anderson brings a time-traveling druid from 16th century Ireland to present day Oregon, with only the hope that she can stop a centuries old curse to carry her through the strenuous journey. Quincy Harrigan's sister-in-law is dying and the only way to save her is to marry the possibly off her rocker Ceara O'Ceallaigh. I wondered if maybe Quincy was the crazy one, because I loved Ceara from the first moment her character came into the plot. She's young and out of place in the modern world, yet she only wants to marry Quincy so that she can save Loni and the other first wives of Harrigan men. I admire her strength because she willingly left behind her family and home to travel into the unknown. Her charm and innocence will bring every reader to their knees! I'm usually pretty easy to please when it comes to contemporary romance novels like Perfect Timing, but Anderson is one of the few authors who raises my expectations of such stories. After Ceara and Quincy married, I had no idea where the story would go from that point. I expected the other shoe to drop, so to speak, but I could not predict how it would play out. Not only is the plot different from what I've read before, but the story seems to forge an original path in romance. Ceara has to learn to to live in the 21st century from social conventions to language and technology. It's fun to see how Quincy and his family take her into their care and heartening to see them extend their family bonds so easily, even when the going gets tough. Perfect Timing is a love story in every sense. As I read, the charming characters made my heart fill with joy and my mind wish they were just as real as the emotions they display. 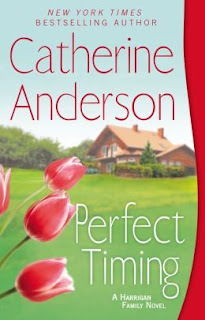 Please, don't miss the opportunity to read Catherine Anderson's latest novel; you won't regret it! What a wonderful love story this is. I laughed and cried with this book. It is truly a wonderful book to read and will not disappoint you. Quincy and Ceara are just wonderful and they are so caring and giving to each other and to others around them. It will make you believe in true love again.